Bird beaks are incredibly diverse. Beaks can be thick and strong to crush nuts, curved like a corkscrew to open snail shells, or even full of combs to make it possible to filter food out of water. These differences arise from the adaptation of animals to their environments. For a run down of various beak types, check out this resource by Zoo Portraits. How did such a wide diversity of beaks evolve? 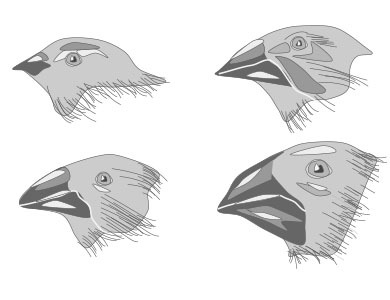 To find out, you’ll try a new twist on an old favorite: A simulation of bird beak evolution! 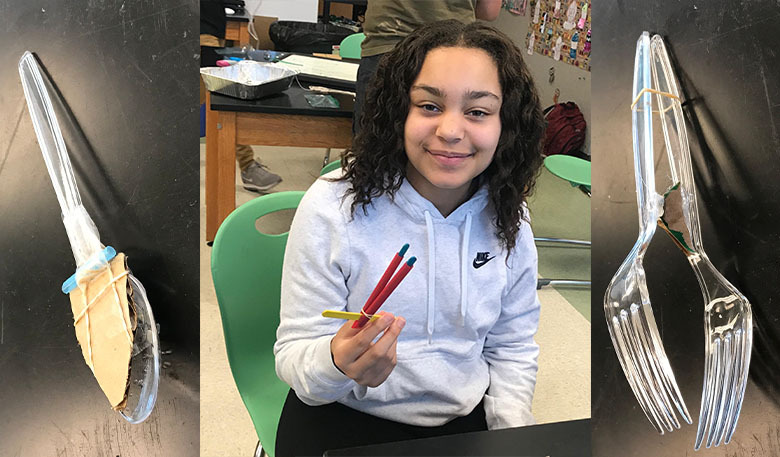 Comparing bird beak designs through simulated food competition is an old evolution lab standby. Often, evolution lessons model and compare the effectiveness of different adaptations, testing models to determine the best one. But why stop there? Genetic variation doesn’t! Genetic variation is the process (by mutation, diverse mating, and other means) by which genetic differences are introduced into a population. Changes build on each other, positive or negative, and genetic variations occur to a baseline that itself was changed, for better or worse, in previous generations. Evolution can move much faster than we think! Adaptations arise over long and short horizons, from multiple sources such as diversity, mutation, environmental conditions, mating patterns and more. Adaptations appear and are tested in the natural environment, and populations that display more helpful traits often have a stronger record of survival. This mechanism has been studied in many environments, from microscopic creatures to large fauna. An excellent example of this is the story of husband and wife biologists Peter and Rosemary Grant, who dedicated decades of their life observing and analyzing the evolutionary change among finch populations in the Galapagos islands affected by extreme weather events. 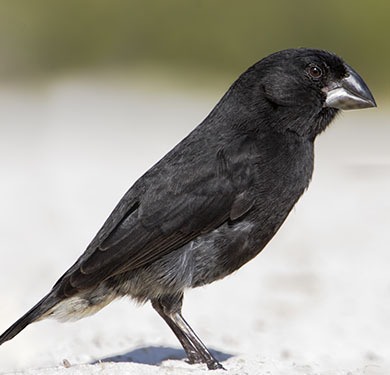 Over 40 years, the Grants observed and catalogued the leg length and beak width of Galapagos finches and drew some compelling and illuminating conclusions regarding evolutionary success. 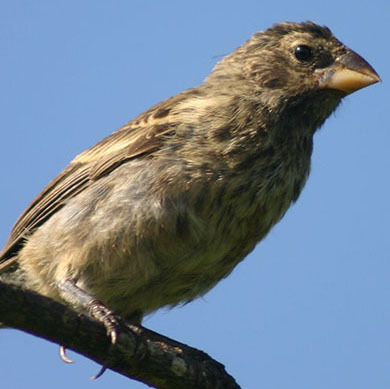 A severe drought caused a great majority of the finches to die out over a 12-month period and the Grants were able to determine that the surviving finches possessed beaks that were better adapted for collecting scarce food resources. This lab seeks to model this adaptive process in the classroom. Learn more about the Grant’s research on rapid evolution in this Science Friday interview. In this activity, success can build on successful variation, allowing you to participate in an exercise on competition, where successful designs are given greater opportunities to adapt and improve. In nature, these changes arise through the confluence of random chance, external conditions, and internal changes such as mutation. As you work, you’ll be using tools of design thinking to maximize your evolutionary chances by simulating generational changes in bird beaks. How do bird beaks, bills, and rostrums work? Actually, they’re just like our jaw! There is an upper and lower mandible that open and close to capture and consume food. Using the design thinking steps outlined below, you will research, design, and build a beak that you think will be good at capturing and consuming food. Working through this process will take the majority of one class period. Review the design thinking steps. The design process helps you learn to problem solve using collaboration and iteration. If you would like to learn more about this process or practice a more formalized design thinking exercise head over to Stanford’s Design School website. The graphic below identifies and briefly describes the five steps of design thinking. This printable design thinking handout identifies and briefly describes the five steps of design thinking for this activity. Record the design process. As you go through the process, record your work along the way so that you can refer to it when you need to go back and edit your design. You can use small whiteboards, graph paper or iPads to capture collaborative notes, sketches and ideas during each phase of the design process. Design and build a beak. Using the following materials, begin the process of designing and prototyping your bird beak. As you work, step through each of the design thinking steps, recording your process. Part 2: Test Your Beak! You will test the effectiveness of your designs, and if your design is one of the most functional, you can earn opportunities to redesign and improve your beak! You are going to test how well your designed beak can consume different food types and model evolution by natural selection at the same time. You will have 15 seconds to collect as much food as possible. Birds that forage more effectively have more energy and less disease and parasites, and therefore they are more likely to reproduce successfully and bear more offspring. In this simulation, the amount of “food”, and the quality of each food type, will determine how many offspring you are able to produce. The number of offspring you produce determines how much genetic variation (represented as build and redesign time) you will move forward with for the next round of “natural selection” (testing). In other words, more successful beaks will get more food and will be granted more time to implement improvements. Thus, the real-world impact of additional offspring is represented in the lab by additional time for modifications to your design before another round of testing. After multiple rounds of testing, your beak design will likely “evolve”! Why do successful beak designs earn more redesign time? Remember: you are modeling the process of mutation, natural selection, and evolution a process that occurs by chance—in the example of the Galapagos finches, the weather events that created the conditions for evolutionary success of a certain beak type were random and unpredictable, and other events could have led to other outcomes. 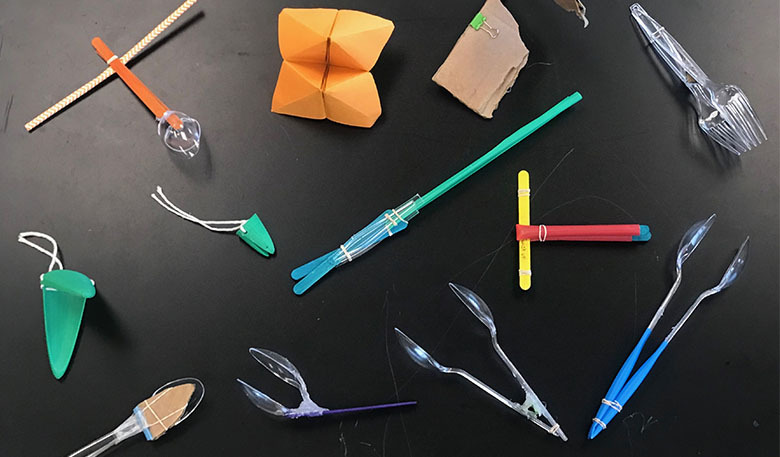 The process of iterative design in this lab is meant to illustrate the selective advantages that can occur through from random mutation. The effect of such events is modeled by the design choices you made, however the real-world phenomenon of genetic variation occurs by chance! Seeds, oats, box cereal, marshmallows, styrofoam, pasta, fruit or even sliced rubber bands. Try to recreate items that birds would typically consume. Whatever you have on hand, the key is variety! Using the beak evolution lab guide, work through the questions, then in a group of 3-5 beak-testers, construct a group data collection table. You can create your data collection table using small whiteboards, graph paper, or a spreadsheet program. You can also use the blank data table in the beak evolution lab guide! Pour the first bird food type onto the tray. When the time-keeper says go (and starts the stopwatch), the beak-tester has have 15 seconds to “eat” as much food as possible by using the beak the collect food and place it into the collection cup WITHOUT using any part of their hands, only the beak! 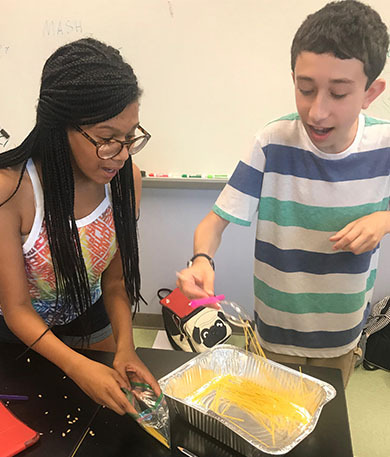 After 15 seconds is up, record the amount of food on the group’s data table in the row for that food type, spilled and dropped food does not count! Repeat steps 1-3 for each food type using the same beak. 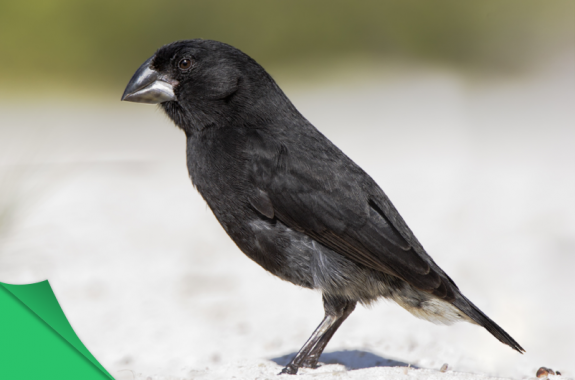 Use the beak evolution lab guide to calculate the number of offspring your bird beak earned, and then calculate how much redesign time you earned to modify the team’s beak. Look at your data and answer the reflection questions on the beak evolution lab guide. Keeping track with the stopwatch, make any changes you want to the design of your beak within the amount of redesign time that you earned! The documentarian should record the changes made to the beak design with a photo, video, or labeled sketch. Repeat steps 1-6 at least three times, to test the new beak design. If you want each group to move at their own pace, place a stopwatch at each station.You can also run the tests at all stations simultaneously and call out the time. Which beak was best adapted to each type of food? Why? Did editing time impact food collection? How? Which beak was least adapted to each type of food? Why? What do you think would happen if the only available food source was bananas? How would your beak fare? What about your classmates’? At the beginning of the activity: Construct more than one beak. Run tests on each beak and actively compare the results. At the end of the activity: What type of ecosystem would your bird live in based on your beak design. Describe any other adaptations or features that your bird would possess based on beak shape and location. Draw and label a sketch of your bird and compare results. Change the ecosystem: Based on your responses to the questions above, run the laboratory activity again and add water to your trays (or sand/soil/etc. ), or place the food in bowls or among gravel. This extension can be completed with the same beaks. Make an iMovie video describing generational changes. Using Thinglink (website or app), label brainstorming sketches. Using Flipgrid, make video reflections about the building and iteration processes. You can use this rubric. 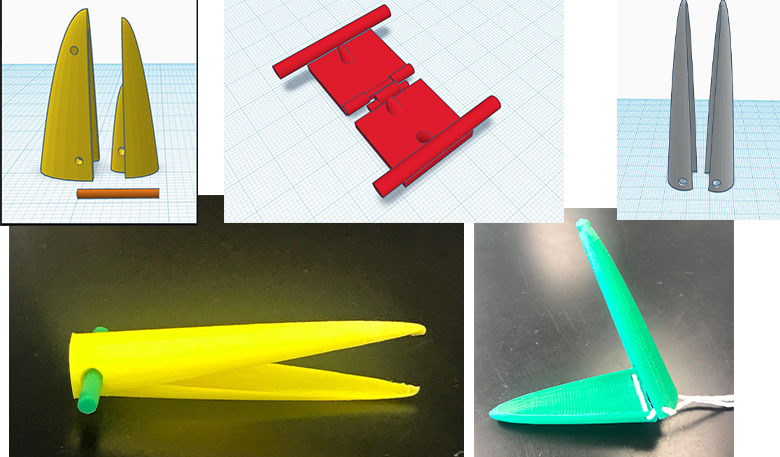 Use CAD software to design and 3D print a beak. Use the design thinking steps as you work. Create prototypes using Tinkercad or a similar free CAD program and upload the .stl file to a 3D printer. The following beaks were made by students in Amy’s 7th grade Life Science class. Howard Hughes Medical Institute put together a fascinating short movie (approximately 10 minutes) about seeing adaptations occur very quickly in pocket mice. National Geographic is reporting on solving a bird beak mystery that has concerned scientists for 20 years! 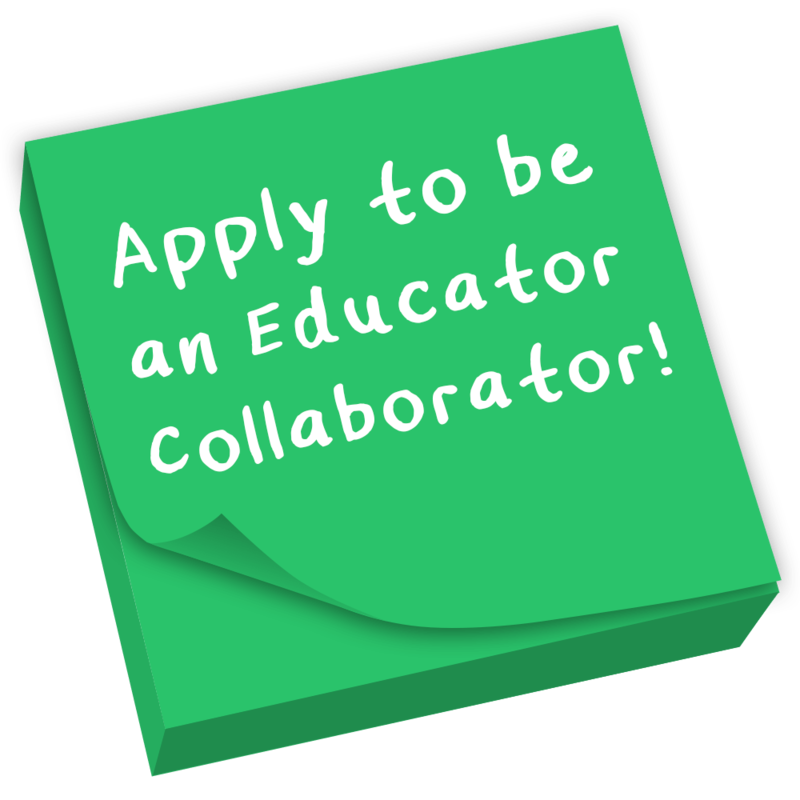 FlipGrid Help: Teacher Tip! I find that the more specific you are in the topic instructions, the more serious your students will treat the response. I typically encourage my students to draft a brief outline about their reflection before posting. This helps them collect their thoughts and stay focused on the topic question. Tinkercad Help: Tinkercad offers a fantastic helpful resources! They have a series of step by step lessons to learn the basics of the program. Additionally, Tinkercad provides video tutorials and delineated maker projects. Vocabulary Review: Understanding Evolution is a fantastic resource. This educational site provides an overview of terms and concepts. This resource also has database for lessons and an image library. MS LS 2-1: Availability of different food types has been found to affect the evolution of physical structures such as beaks. MS LS 2-4: This activity models the evolutionary advantage of increased offspring. MS-LS2-5: Different design solutions do best with different food supplies and take advantage of biodiversity. MS LS 4-4: In this experiment, success brings greater opportunity for reproduction. MS ETS1(ALL): This engineering design standard describes a process very similar to the design thinking approach modeled in this experiment. Amy Cataldo is a middle school life science teacher at Edmund Burke School in Washington, D.C. With nearly 20 years of classroom experience, she believes in practical, “show don’t tell” education, and constantly designs and implements lab and classroom activities that allow students to put critical scientific principles in action for themselves.